There is 16 inches of ice and barely any snow on top. Trucks and sleds are still going out without a problem. It is just a very bumpy ride out. We had a thaw last weekend so the ice got pretty rutted from all the traffic and then all the ruts froze, so it is rough riding out and slippery walking around out there. We have been selling ice cleats like crazy this week! The perch have moved into shallower water and nice-sized, keeper walleyes are coming in pretty frequently now compared to what we have seen earlier in the season. Lyman’s On The Lake shared Cody Newman‘s photo. Biggest I’ve landed on a jig pole. Heading back out in the AM, see ya at 7! Said to be 8+ inch. of ice . Had about 3 dozen fishermen in this a.m. and as many tonight. Quads and sleds still being used. Be safe and fish on !! My good buddy and loyal customer, Jeff Tenney put the tines to this 26 incher this morning. Good work Jeff! On Saturday after Fridays wind, warm temperatures and rain, Pizza Plus sponsered their Annual Speed Fishing Tournament. The phones and e-mails rang constantly by those expecting the lakes to be open water. It did not happen. It did melt the snow! Lakes Cadillac and Mitchell have 12″ to 15″ of measured ice. No slush, just slippery. Four wheelers and an occasional compact pick-up trucks cross the lakes for those who prefer not to walk. Saturday was blue skies, sun and breezy, perfect conditions for competition. What is fun about this type of tournament is that anyone can win. 10 anglers paid the $25 entry fee for the one hour of fishing. Every ten minutes a whistle blew and every one moved clockwise to a new hole. Only one line and bait are allowed. No electronics. The largest legal fish by length receives the 100% pay out. A few Perch were caught up to 6″. Later a couple of gills, the largest 7″. Finally a 9″ Crappie at the closing minutes. James Cornelius has fished the Speed Tournament past years and collected the payout by landing the 9″ Crappie. Speed fishing is fun and anything can happen. Past years 6″ and 7″ Perch have won all the money. See Pizza Plus for next years Tournament, come rain or shine they’re in. Bring your power augers, there’s lots of ice. It’s slick on top, a wise investment would be a pair of creepers if fishing before the next snow. There’s lots of winter to go. Saginaw Bay: Catch rates were poor over the last week. Much warmer weather moving into the state will soften the ice once again. Anyone going out on the ice will need to use EXTREME CAUTION. Spud your way out and don’t take a quad or snowmobile out. An Argo went through the ice off the Bay City State Park. A fair number of anglers at Palmer Road but catch rates were slow. The water was still murky. Anglers were fishing in 3 to 7 feet from shore ice that was still hanging on. Ice conditions were bad near the mouth of the Pine River. Some were walking out from the Bay City State Park however the ice was not good. The ice near the mouth of the Saginaw River was questionable. Some were walking out from the end of Jones Road and fishing the Hot Ponds but they reported mostly carp in there right now. Fishing off Vanderbilt Park was not good. A few crappies and bluegills were taken in the Quanicassee River and the Sunset Bay Marina. Some perch were taken off Geiger Road but ice conditions were not consistent. The Sebewaing River and marina froze over again but the ice was not safe. Saginaw River: Did freeze again however ice safety was questionable. A few anglers were creeping out and fishing close to shore at various locations but again the ice thickness was not consistent. Little Bay De Noc: Had few anglers and catch rates were down. Anglers are fishing as far south as Portage Point but open water starts around Breezy Point so use caution if venturing out in these areas. Ice conditions were good in the northern Bay but much thinner near Portage Point. Saunders Point had a large area of open water that just froze over and was considered DANGEROUS. Walleye catches were reported throughout the Bay but the southern waters were best. The Escanaba ship docks or just south of the Escanaba River reported fair catches when jigging rapalas or using tip-ups in 18 to 22 feet. Several large pike were also reported in this area. The best catches were between Aronson Island and Portage Point in 25 to 45 feet. Fair walleye catches between the Center and the Second Reef in 20 to 35 feet. Perch catches were down. The best area was between the Second and Third Reefs when using wigglers or mousies in 17 to 28 feet. A few nice catches were reported from the flats off Kipling in 24 feet. A lot of undersize walleye and pike were also reported in this area. The Escanaba Yacht Harbor reported good catches of perch though many were on the small side. Whitefish anglers caught fish near Gladstone when using minnows in 28 to 40 feet and off Sand Point with minnows or spawn in 80 to 90 feet. Houghton Lake has 10 to 16inches of ice and pike and walleye, pike and panfish have been biting the pre spawn bite has started and bigger walleye have been caught this week. Call Angelo’s Party Store 898-202-4422 he has all his shanties out this weekend, , Four Season Party Store 989-422-5230 and H&H Fireworks (989) 366-0126, Lyman’s on the Lake 989-422-3231. Guys are catching walleye but go small, use a blue head and keep the jig still and leave it on the bottom. Burt Lake the perch are biting on Maple Bay. Detroit River: A few perch were caught in the cuts, canals and marinas. Fish were reported in the canals around Gibraltar. Fishing is pretty much open water. Oakland County: Both Union and Cass Lake had a good number of anglers but fishing was slow. A fair to good number of pike were caught on tip-ups or seen through the spearing holes but most were undersize. A handful of bluegills were caught in front of Dodge State Park on Cass Lake. Ice thickness varies from one spot to the next so anglers will need to use extreme caution. Lake St. Clair: Had ice and fishing once again in areas like Fairhaven and Metro Beach but most of the lake has rather thin ice cover which will most likely be gone by Friday. Wind speed and direction will play a big role in how long the remaining ice sticks around. Anglers will need to use extreme caution and recognize that wind and warm temperatures can result in ice conditions that can change quickly. Moving ice becomes a problem and anglers may find themselves stranded on ice floe. Anglers should avoid fishing where the winds can potentially push the ice away from shore. Harbor Beach to Caseville: Harbor Beach had open water. There was no fishing activity at Caseville or Port Austin. Tittabawassee River: Was not fishable due to floating ice. Ice conditions improved on most lakes other than the ones in Allegan and Van Buren County that received significant snowfall. Anglers still need to use extreme caution and watch the shoreline ice which may be weak in areas. Bluegills and crappie were hitting on jigs and wax worms in 10 to 20 feet. Go with very small jigs or even ice fly’s as it seems the regular size teardrops were not working. St. Joseph River: Steelhead fishing has been good during the warm spells so look for some good action by the weekend. Grand River at Grand Rapids: Catch rates slowed during the artic chill but should rebound by the end of the week especially with runoff after the rain and melting snow. Try spawn and wax worms up near the 6th Street Dam and near the mouth of the Rogue River. Grand River at Lansing: Look for the pike and walleye bite to improve with the warm up. Try small sucker minnows or golden shiners. Muskegon River: Is producing a fair number of steelhead but the number of fish caught should increase by the weekend. Munising: Ice conditions improved with the cold weather. Some areas have “shove ice” which is ice that broke up and has slid under other sheets of ice making it somewhat difficult to drill holes. The ice around Powell Point improved so anglers had access. There is still open water in the main channel west and east of Grand Island. Fishing in general was slow. Most are targeting whitefish and splake with an assortment of eggs, wax worms and minnows. The fish are running small 10 to 12 inches and were found in 50 to 60 feet. Some legal size splake were caught in 70 to 80 feet however anglers were putting in their time to catch them. Those fishing at night were targeting burbot. Cedarville and Hessel: Perch fishing improved, especially if one moves around. Splake fishing was good in Wilderness Bay. Be aware of thin ice from Middle Island to the south. Smelt are working the best for perch and splake. Muskie Bay is still quite slow for perch but good for pike. Smelt are biting on Green Lake with Hali’s tipped with a spike or waxworks. Some are using minnows also. These were all taken out of Portage Lake. Wow, now that’s a fresh fish dinner you just can’t buy!! Dave Bode from McBain caught this 42″, 20lb pike on Higgins Lake using a golden shiner on a tip-up. Dave was fishing in about 45′ of water. CJ Fiedler knows where to find the big panfish and how to get them to bite. He found these perch slabs on the north side of Houghton Lake yesterday in about 11′ of water. One was caught on a tip-up with an emerald shiner and the other jigging. Chip from Game Hog Charters is pleased with his student, Dave. Fishing on one of Chip’s spots this time, Dave found the fish. This nice, 20 1/2″ eye was caught on a NI/BL Do Jigger with minnow. The 16″ eye was caught on a Fish Bones Bloody Nose jig with a minnow. Chip’s 28″ pike preferred a blk/silv Jigging Rap. The ice is 15″ to 18″ with a little drifting snow. Warmer weather later in the week will hopefully turn on the fish. It will also make the ice slick so prep accordingly when you go out. We got some new tackle in and have the basics you’ll need to go fishing! Ice fishing continues in the northern section of the Lower Peninsula and the Upper Peninsula. Anglers in the southern half of the Lower Peninsula will need to be extremely cautious especially with rain and much warmer weather moving in. It was a good cold weekend that seperated winter lovers from those that must tolerate it. Snow lovers were happy. Snowmobilers got to run on Cadillac’s groomed trails. Skiers enjoyed the fresh snow at Caberfae. Ice fishermen have plenty of ice on all area lakes. Houghton Lake has 12 to 18 inches of ice and pike and walleye, pike and panfish have been biting the pre spawn bite has started and bigger walleye have been caught this week. Call Angelo’s Party Store 898-202-4422 he has all his shanties out this weekend, , Four Season Party Store 989-422-5230 and Wright’s 989-202-4531 H&H Fireworks (989) 366-0126, Lyman’s on the Lake 989-422-3231. Mark your calendar!! Spread the word!! Thank you to all the sponsors!! Osborn’s Sport Shop added 14 new photos. Here are some pictures of the Prize winners. Congratulations to all. Hooked up on Higgins Lake added 2 new photos. Saturdays group had a fun day! All limited out! Had a good day with Frank & Mike today. Bite was slow this afternoon. Pilgrims Village Fishing Shop added 2 new photos. The North American Snow Festival’s Ice Fishing Contest is now History. Hundreds participated on a beautiful 30 degree day. Thank You Fox Motors of Cadillac for sponsoring the event. Those who caught the largest Northern Pike, Walleye, Bluegill, Crappie or Perch were awarded a Shappell FX200 2 man flip tent. Hundreds of prizes were then awarded to the remaining registered anglers weather they caught a fish or not. Although there are several thousand acres among the two lakes, the West side of Lake Mitchell is still the most consistent area for mixed catches of fish. There are several areas of living green weed patches in and around the Big and Small Coves. Find them in 12′-15′ depths and its almost a sure thing. Often anglers from Southern Michigan are concerned about the ice conditions, at least until they see quads and snowmobiles criss crossing the lakes. You must be cautious of slush. Expect 6″-8″ of clear ice with 5″-6″ of white ice on top of that, with 2″-5″ of slush on top of that. There’s also an inch of crusty snow on top of that. Cold temperatures are returning which should tighten the lakes up. The fish are getting confused, warm, cold, snow and rain. One day limits of panfish are easy, ususally of Crappie. Fish the same holes the next day and catch only a few. The bite runs hot and cold. Over half the winters over and it’s not as easy as when we started. The fish are there! Often those using electronics mark plenty of fish but can’t get them to bite. The days are getting longer. Fish fisrt light and late afternoons into dark for the most aggressive bite. Cut more holes then you need and hole hop. Even when the fish are lathargic there’s always a few that want to play. When fishing Lakes Cadiilac and Mitchell always set a tip-up. Pike seem to be anywhere and everywhere. This species is always looking for an easy meal. Tip-ups baited with Walleye minnows may catch Walleye but also often catch those 12″ slab Crappies. The Perch and Crappie are biting on Lake Mitchell. Nolan VanOrder shows off an 11″ Crappie and 9″ Perch part of his catch. Fishing with his dad, Trent Mitchell landed a 35 5/8″ Lake Cadillac Pike. Nice fish, Bad picture. Zack Gill is the Perch King. He’s holding a 14″ and 14 1/2″, both over a pound caught on Portage Lake. Smelt fishermen your prayers have been answered. 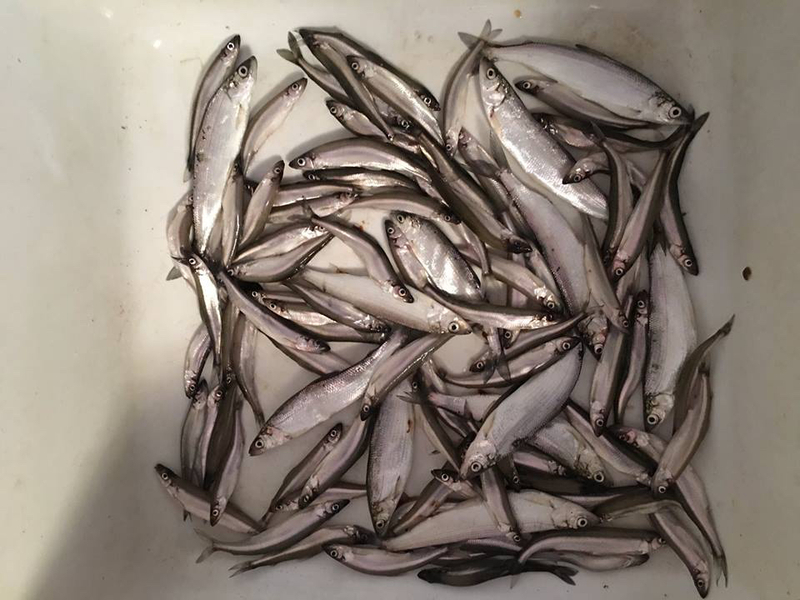 Anglers are reporting worth while catches of Smelt on Green Lake. Higgins Lake – Want some variety? The opportunity to catch Perch, Lake Trout, Whitefish, Smelt and Trophy Pike is there. Today was another great day to be out on Houghton Lake ice fishing!! We had the pleasure of meeting Mark Martin and gladly delivered lunch out to everyone attending his class this afternoon! Saginaw Bay: Ice fishing is very limited and is strictly a nearshore activity as there are just a few locations where shore ice was hanging on. Ice quality is BAD, with thickness varying widely within just a few feet. It is NOT advisable to try and take a snowmobile or ATV out on any remaining ice. The ice is not good off the Pine River access site. Some ice was still hanging on at Palmer Road, but perch fishing was slow and the water was murky. A few small perch were caught off White’s Beach and Pinconning. At Linwood, the marina opened their boat channel and a number of small boats were trolling about five miles out. They caught walleye on crank baits however be sure to watch for ice floes. If anyone launches from Linwood Beach, they should be sure to leave their cell-phone number with the marina, as ice floes can move in and block the channel making it impossible to get back in. The launch at the mouth of the Saginaw River was not useable because of too much ice. Boats were launching from the Hampton Township ramp at the end of Jones Road and fishing about five miles out. The Quanicassee River is wide open, running high and fast. A few crappie and small perch were caught inside Sunset Bay Marina. Any ice from Sebewaing to Sand Point was not safe. The Sebewaing River and the marina are wide open. The water is running high, fast and muddy. Saginaw River: Most launch sites were useable but take a bag of sand or salt for traction on the ramp. The water is running high, fast and muddy. The Patterson Road ramp at the mouth of the river was not useable because of too much ice. Little Bay De Noc: Ice conditions remain good in the northern section from Gladstone Bay to Garth Point. Pressure cracks tightened up over the last week making travel better in several areas. Saunders Point is considered DANGEROUS because of open water. Ice in the southern bay improved as far south as Portage Point. A pressure crack at Aronson Island is running several hundred yards south. Anglers are using extreme caution when navigating this area. The best walleye catches were reported south of Aronson Island in 25 to 45 feet when using jig raps with minnows or tip-ups with sucker minnows. Good numbers of large fish were reported. Whitefish were also caught in this area. Fair to good walleye catches in 15 to 20 feet south of the Escanaba River, 25 to 34 feet in Gladstone Bay, 23 to 30 feet near Kipling, and 14 to 24 feet near the Day’s River. The better perch fishing was in 17 to 35 feet from the Second Reef north to the Center Reef when using mousies, wigglers or minnows. Good numbers of smaller perch were taken in the Escanaba Yacht Harbor. Pike were still active and some large fish were taken in 15 to 20 feet just south of the Escanaba River. Try tip-ups with sucker minnows. Those spearing did well in 5 to 10 feet near Butler Island but the water was stained. With the snow storms the first of the week many of the lakes have slush again Ice fishing season is finally here! Houghton Lake has 8 to 12 inches of ice and pike and walleye, pike and panfish have been biting and it is Tip Up Town Weekend. Call Angelo’s Party Store 898-202-4422 he has all his shanties out this weekend, , Four Season Party Store 989-422-5230 and Wright’s 989-202-4531 H&H Fireworks (989) 366-0126, Lyman’s on the Lake 989-422-3231. Burt Lake: Has ice anglers but use caution until colder temperatures have a chance to shore the ice back up. Some were fishing Maple Bay. With the warm weather this week walking out was the safest bet at this time. Mullett Lake: Some were out fishing on the south end in Scott Bay but again use caution. Ice thickness was variable and can change quickly from one spot to the next. Walking was the only mode of safe travel at this time. Higgins Lake: Lake trout fishing has been hot! Fish have been caught in 80 to 110 feet when using greys or jigging Swedish pimples, sand kickers and raps. Perch were caught up by the church camp, B&B Sports, Kelley Beach near Flag Point, and Lincoln Avenue on the south end near the State Park. Anglers may also want to try around the Main Island. Fish were caught in 30 to 60 feet. A few pike are still being caught on tip-ups including one 47 inch fish. No word on whitefish yet. Houghton Lake: Ice conditions were slick making travel just a little more challenging. Some of the better fishing has been right at first light and last light though walleye were caught along the deeper flats at mid-day. For walleye, anglers were using a slow presentation with a jig and minnow head. Put it right on the bottom and let it sit there then bring it up really slow. Some nice crappies were taken on perch minnows. Bluegills were caught near the Middle Grounds and the south shore weed beds. Perch were caught in the East Bay and the pike were still active. Lake St. Helen: Was producing some nice pike including one measuring 38 inches. Bluegills and some perch measuring 12 to 13 inches have been caught. Crappie fishing was good in the evening. Walleye catches slowed and many were sub-legal. Ice was in good shape with hard snow cover. Tawas: There’s still some ice up in the “armpit” of Tawas Bay near Jerry’s Marina and also inside the state harbor…but it’s not good quality ice at all. Anglers near Jerry’s caught a few lake trout and brown trout but very few walleye. Smaller perch were also caught. The water was reported as murky after the recent rains. Just a few small perch were caught inside the state harbor. Tawas River: Was open water. Shore anglers caught a couple steelhead when using spawn. Au Gres: Did not have much fishing activity due to poor ice or no ice at all. Au Gres River: Surf anglers fishing at the mouth of Whitney Drain caught several steelhead. Most were floating spawn sacks. Torch Lake: Has open water. Traverse City: Both bays had open water. Crystal Lake: In Benzie County has open water. Betsie River: Has steelhead fishing. Green Lake: Was starting to produce some smelt. Lake Cadillac: Ice anglers are still targeting pike, walleye and panfish. Anglers are marking fish but getting them to bite has not been easy. Pike numbers were still good for those using tip-ups. Lake Mitchell: Continues to offer up ice fishing as well. Look for the bite to slow with the onset of much colder temperatures by the weekend. Lake Missaukee: Still had ice fishing. Anglers were taking panfish and pike. Manistee River: Has steelhead fishing. With colder temperatures in the forecast, check out the deeper holes. Pere Marquette River: Has steelhead. Lake Gogebic: Had deep slush on the north end in Bergland Bay. Try to stay on the hard pack the snowmobiles made for easier travel but drill your holes away from the hard pack. Travel on the west shore was good however wheeled vehicles should not be on the ice. Walleye fishing slowed and the perch bite has not picked up yet. The walleye bite was sporadic with a few fish taken in 15 to 20 feet. Catch rates for perch were limited. Try wigglers in 20 to 28 feet. The east shore boat launch was slushy. It was not as deep as Bergland Bay but the slush did extend from the boat launch to the south end of the lake. Keweenaw Bay: Anglers fishing off the pier in L’Anse have picked up a couple of rainbow trout on spinners and Cleo’s. Those fishing off Sand Point reported some good catches of coho and a couple splake when casting Cleo’s or Swedish pimples. A couple rainbow trout were caught on spawn and spinners in the Falls Rivers. Menominee River: The hot spot continues to be the 6th Street Slip with walleye being the target species. Anglers are jigging minnows and plastics in 30 feet. Electronics have been very helpful. Some trout were caught in open water by the dam above Hattie Street. Small Cleo’s and raps worked well. Munising: Still has ice in the bay however areas to avoid because of poor ice and/or the movement of ice are Powell Point, the City Docks, and Sand Point. Strong winds coupled with strong currents have caused the ice to deteriorate especially at Sand Point which was pretty much open water except for broken ice near shore. The fishing tug has moved up shore and has cut a different path towards the channel so this area would not be safe. Those on snowmobiles should NOT cross Munising Bay. The better ice was off the Pictured Rocks dock and the Anna River access. Catch rates were mixed with a few splake and whitefish taken on a single egg. Those fishing off the Anna River had poor success. Munuscong Bay: Was very slow for walleye and perch with the exception of Grassy Island which is where most of the fish were coming from. The ice east of Roach Point was still questionable. Cedarville and Hessel: Muskie Bay has been producing a few nice catches of perch. Pike spearing is fair to good with plenty of undersized fish. Government Bay is also a very good spot for pike. Hessel Bay has produced some perch. Lake Erie: Had no ice. There is one dock in at the Metro Park and a few boats were out trolling husky jerks for walleye. Detroit River: The water was high and fast and in some areas it was muddy. A few boats were out fishing but anglers will need to pay close attention to wind direction and watch for ice floes coming down. Oakland County: Shoreline ice was thin but should tighten back up. Anglers on Union and Cass Lakes were targeting panfish when using small plastics and wax worms. Those doing the best were hole hopping to stay on the fish. A few nice size pike were caught or speared in 4 to 10 feet. Lake St. Clair: Had no ice fishing at all and while colder weather is coming, it will take at least a week of very cold weather before ice fishing returns. Tittabawassee River: Shore anglers were taking a few walleyes just upstream of the Gordonville Road launch and down at Mapleton. Catch rates were spotty as the river was high, fast and muddy. Best baits were an orange ¼ ounce jig head with a white twister tail to increase visibility. Anglers could launch at Gordonville Road and fish upstream to the Dow Dam or downstream to Freeland. Shoreline ice on the inland lakes deteriorated during the rain and warm spell but should tighten up again with the colder temperatures. Extreme caution should always be used on the ice especially in the counties along the Lake Michigan shoreline which are getting significant snowfall this week. St. Joseph River: Anglers were still catching some steelhead downstream of the Berrien Springs Dam. Try spawn or wax worms. The occasional walleye was also taken further upstream. Grand River at Grand Rapids: Anglers are catching steelhead near the 6th Street Dam and near the mouth of the Rogue River. Most are using spawn and wax worms. Grand River at Lansing: A few pike were caught on sucker minnows above the North Lansing Dam. A couple walleye were taken on minnows below the North Lansing Dam and in the Red Cedar River. Muskegon River: Water levels were still a bit high and fast. A fair number of steelhead were still being caught all the way up to Croton Dam. Tuesday nights snow and rain storm, has changed our lakes. In many places but not all there’s lots of slush on our lakes. Making it very sloppy. In most areas it’s obvious. The clear ice beneath is still 6″-8″. There is always the possibility of quads and snowmobiles getting stuck. This is Michigan and the temperatures will drop from tonight on, this may help. The coves on the West side of Lake Mitchell have become very popular. The words out, the bite is on. Those using quads or snowmobiles easily find the deeper pockets of healthy green weeds in the 12′ to 15′ foot holes. Many of the anglers who walk out spend too much time in shallower water and don’t do as well. Early mornings and late afternoons have been the best time for Crappie anglers limits. 8″ – 10″ Crappies have been common. Small minnows are their favorite but some are caught on spikes and wax worms. Bluegills and Sunfish anglers have been very productive with red spikes. We’re seeing good numbers of Blugills with larger better fighting Sunfish mixed in. They’re much thicker, especially when they’re in the 9″ range. Pike are Pike! Fishing either Lake Cadillac or Lake Mitchell set a tip-up or two. There’s no one hot spot. They seem to cruise all depths. We hear of Walleye stories but don’t know of any particular areas better then others. Those catching them don’t want any company. Crappie and Blue Gill biting real good after 3:00 pm. Lots of Pike caught this past week. 37″ 11.82 pounds was the biggest I saw. Perch fishing better than ever, several 13″ were caught. Walleye have been caught early and late in the day, a lot of undersized which is great for the future. Call Dave@ 989-389-2100 if you need more information. This is one happy little fisherman! This is a great catch in anyone’s book. Corey and I fished Hamlin tonight. Good ice, but sloppy. Solid 5 inches. Bluegill bite was decent but not outrageous. Definitely worth fishing though. A rare photo…Chip, Clare and Dave together. The other day they teamed up to scout for new fishing spots and to check the ice. And, it looks like HL Legend, Clare Gee was the only one who remembered to bring his GPS that day. Tonight Clare was using a Fish Bones Blue Shiner jig tipped with a minnow head. He had one 16″ walleye, 5 throwbacks and 7 pike. Clare has built a 2-limit lead on his chief rival, Dave. Beautiful morning on the bay today. 12 inches of ice and a few inches of snow on top. Perch were biting this morning. Lure of the month & guess who sells them? Yup, that’s right! Only at your favorite corner store! Saginaw Bay: Most of the ice blew out last week, leaving only shore ice. The only fishable spots left were near Standish and Pinconning; the Pine River/Palmer Road area and off Pinconning Park and Newman Road. EXTREME CAUTION must be used and travel by ATV is not advised! Anglers did get some perch from those areas however warm temperatures continue to eat away at the ice. There may still be some fishing opportunities for perch off Vanderbilt Park near Quanicassee but strictly in shallow water only. Saginaw River: The ice was no longer safe but there was still too much in the marinas to launch a boat. Little Bay De Noc: Warmer temperatures were creating a few hazards throughout the Bay especially the southern waters were the ice was not that thick. Anglers reported minor problems crossing Butler Island in a few areas. Anglers were fishing north of Gladstone Bay. Fair walleye catches reported south of the Escanaba River and out from the Power plant in 25 to 35 feet when jigging raps or sucker minnows on tip-ups. Use caution in this area which is known for dangerous ice conditions. Fair catches reported from the Center Reef south to the Second Reef in 20 to 35 feet when using tip-ups with sucker minnows. The number of perch caught has not been high but the fish are averaging 8 to 16 inches. The best areas were between the Second and Third Reefs with minnows or spikes in 17 feet and off the Second Reef in 23 to 30 feet. The head of the Bay reported catches in 10 to 20 feet. The Escanaba Yacht Harbor had good catches but many were small. Whitefish anglers started fishing off Sand Point but the ice conditions worsened so no one was fishing. A few whitefish were caught on minnows in Gladstone in 27 to 35 feet. The northern pike action was good off the mouth of the Day’s River and the Second and Third Reefs but many were undersize. Most were using tip-ups with sucker minnows in 14 to 30 feet. With rain and warmer temperatures especially in the southern half of the Lower Peninsula, ice fishing on the inland lakes has become much more dangerous. Anglers would be wise to stay off the deeper lakes and fish in shallow waters only. Don’t venture out on lakes that you are not familiar with. It pays to know depths, where drop-offs are and the location of any inlets or outlets. River ice was no longer safe. Black Lake: The 2016 lake sturgeon fishing and spearing season will begin at 8 a.m. on Saturday, February 6. All anglers must register with the DNR to participate and must also possess a lake sturgeon tag which can be obtained for free at any license vendor. Grand Lake: Was producing walleye and perch. No large numbers but the fish were good size. Long Lake: Anglers were catching walleye and perch. Hubbard Lake: Walleye and perch were starting to bite in 50 to 55 feet. Anglers using tip-ups with blues near the bottom had better success. Van Etten Lake: Was producing a large number of small perch. Higgins Lake: Still has ice fishing however anglers should still be careful and drill their way out as ice thickness varies in some areas. Lake trout fishing has been very good in 85 to 110 feet when using greys on tip-ups or jigging. Swedish pimples and big spoons also caught fish. Good perch fishing in 40 to 60 feet. Try the area near the church camp. Trout and pike were caught off the south end. Houghton Lake: Ice fishing continues. Anglers should avoid the areas near inlets and outlets and use caution near the pressure cracks. Bluegill, crappie and perch have been caught off Saunders Point near the Cut River. Those using tip-ups caught some big pike measuring 30+ inches. Lake St. Helen: Was producing pike and panfish. Tawas: Most of the ice blew out leaving only shore ice. The only fishable spots left were the north end of Tawas Bay in the “armpit” and west of Jerry’s Marina but again, extreme caution needs to be used. River fishing remains consistent, although water levels will be rising due to significant melt and rainfall. Green Lake: Smelt fishing has been poor. Numbers are low and the fish are small. Lake Cadillac: Has had a good number of anglers fishing mostly for crappies and northern pike. Tip-ups with large minnows or spearing have done well for pike. Lake Mitchell: Ice anglers continue to do well for crappie and the bluegill bite did pick up some. Anglers are using minnows, spikes and wax worms. No word on walleye. Pike are still being caught. Portage Lake: Some decent catches of perch and bluegill were reported. Manistee River: Has steelhead fishing and those heading out have caught some nice fish throughout the river. Hamlin Lake: Anglers are taking bluegills, perch and some walleyes. Those seeking pike are spearing or using tip-ups with sucker minnows. Lake Gogebic: Had good walleye fishing with some limit catches reported. Some jumbo perch were also caught. Menominee River: The 6th Street Slip was the hot spot for walleye due in part to the lack of ice by the Hattie Street Dam. Anglers are jigging with a variety of small spoons and jigs tipped with minnows. Those fishing the open water near the dam have caught a few rainbow and brown trout when casting small spoons or rapalas. Munising: Ice conditions in the bay varied and caution needs to be used. There may also be more open water after the strong winds. Most anglers were targeting whitefish or splake. The whitefish are running small. The keepers were between 12 and 14 inches. Catch rates for splake were slow and most of the fish were sublegal. Most are using a single egg but a few were jigging fatheads in 50 to 60 feet. The ice off Powell Point had areas of open water and was questionable. The area near the city docks is limited due to tugboats that have been operating on a daily basis. Off the Anna River access, anglers were fishing in about 60 feet and reporting fish within one or two feet from the bottom. Most were small whitefish and splake. The area off Sand Point was not safe as there was open water within 100 to 200 feet offshore. Indian Lake: In Schoolcraft County was slow for perch and walleye but a fair number of brown trout were caught. Big Manistique Lake: Was producing good catches of walleye and large perch. Brevoort Lake: Was producing some northern pike and a few walleye. Water depths vary but most were in 12 to 15 feet. Minnows worked best. Anglers still need to use caution. Munuscong Bay: Was slow for walleye except for the area around Grassy Island. Perch are pretty much scattered throughout. The ice east of Roach Point was still “iffy” so use caution when traveling on the ice. 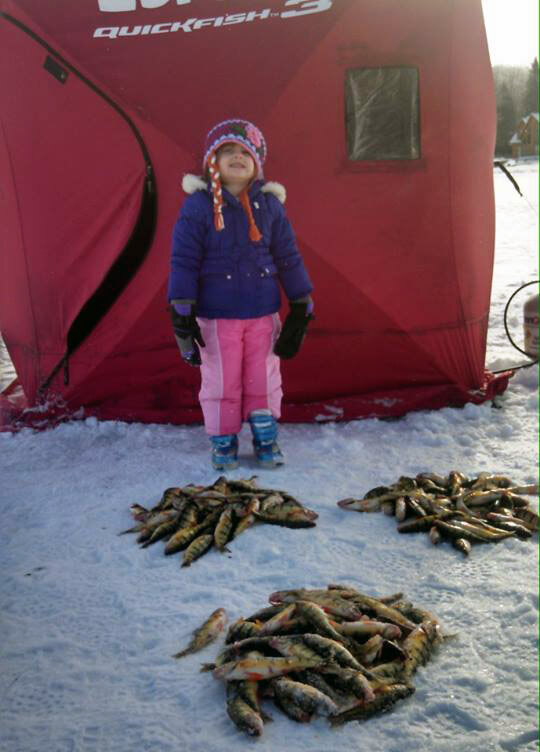 Cedarville and Hessel: Les Cheneaux and Hessel Bay were good for perch with some nice catches reported. A few splake were also caught. Muskie Bay was slow for perch. Government Bay was very good for pike. Anglers are still encouraged to use caution on the ice. Huron River: Steelhead success was marginal at Flat Rock. Those able to access the river by small boat were taking a few fish out of the deeper holes. Those fishing below the Belleville Dam caught a couple walleye. Detroit River: Ice floes have pretty much put a halt to anglers going out in boats. Oakland County: Anglers on Cass Lake and Union Lake are advised to use extreme caution especially after the rain and warm temperatures. Ice thickness will vary from one spot to the next and it may be best to stay in shallow waters. Those that had been fishing caught a decent number of panfish on wax worms in 6 to 12 feet. Those targeting walleye and pike had the best action right before dark when using glow lures and minnows. Lake St. Clair: Multiple vehicles went through the ice at Fairhaven. With the rain and warm temperatures, all the fishable lake ice is pretty much gone. The canals and marinas will be questionable. Proceed with extreme caution as ice conditions can change dramatically in a short distance. The boat ramps at the Harley Ensign Launch are ice free so anglers could launch a boat. Tittabawassee River: It was possible to launch boats from the ramp at Gordonville Road south of Midland. There is open water upstream to the Dow Dam and downstream as far as Freeland. Boat and shore anglers have been catching walleye on jigs and twister tails or jigs with minnows. A couple steelhead were also caught. Even though temperatures are dropping at night, warm temperatures during the day coupled with rain are not helping ice conditions. Constant thawing and refreezing are producing honeycomb ice which is not safe. Anglers need to use extreme caution. St. Joseph River: Anglers are doing well for steelhead downstream of the Berrien Springs Dam. Walleye were caught further upstream. Kalamazoo River: More anglers were out with the warmer weather. Those fishing spawn, crank baits, or wax worms were taking steelhead below the Allegan Dam. Grand River at Grand Rapids: Anglers will need to pay close attention to fluctuating water levels caused by rain, run-off and moving ice. Steelhead are still being caught up near the 6th Street Dam. Anglers are using spawn bags and crank baits. Look for panfish in the backwaters. Some limit catches were reported in the bayous. Grand River at Lansing: Was quiet for the most part. A few walleye were caught near the North Lansing Dam. Try shiners under a bobber or tight lining. Muskegon River: The fish are there and those targeting steelhead are finding fish throughout the river including near Croton. With water levels up a bit, most fish were caught in areas where the water was slower. Charlie Hendrickson caught this one a couple minutes ago in Portage Lake. They are going to get nothing but bigger for the contest. 1.79 Pounds and 15-1/2″. Captain Chuck’s II Inc. shared Ashela ‘Lauth’ Trevino‘s photo. Ashela ‘Lauth’ Trevino added a new photo to Captain Chuck’s II Inc.‘s timeline — in Fountain, Michigan. All 7 of us limited out today! Managed a few good ones. First ice fishing trip for Sierra on Higgins lake South-end. She caught the biggest one of the day and reeled in 20 by herself.